July | 2006 | Bitchbears, Unite! It seems we are now known as the animal house. I guess I can see why… in the past year we’ve had two dogs, a cat, a hedgehog, five baby rabbits, a gold fish, a group of sea monkeys, and now a turtle. Mind you, the rabits, fish, and sea monkeys all died under our care… Still, we’ve become the animal sanctuary for the neighborhood. My mother went out with the dogs early this morning after a heavy downpour. She rounded the corner of our block and found a rather large turtle laying in the grass. No one in our neighborhood has a turtle. A few minutes later, I woke up with the slow moving creature feet away from my face. For a large part of the day, we kept the turtle on the porch, hoping he would warm up. Noticing the webbed feet, I put him in the bathtub in a few milimeters of water. Later we moved him outside and asked if anyone knew him. The turtle decided to escape, running down the sidewalk. By running, I mean crawling at a good 100 ft/hr. By escape, I mean go towards the end of the sidewalk and then turn back. We eventually got a hold of a neighbor who fishes quite often and asked him to take a look. As it turns out, we found a large snapping turtle. Lovely. 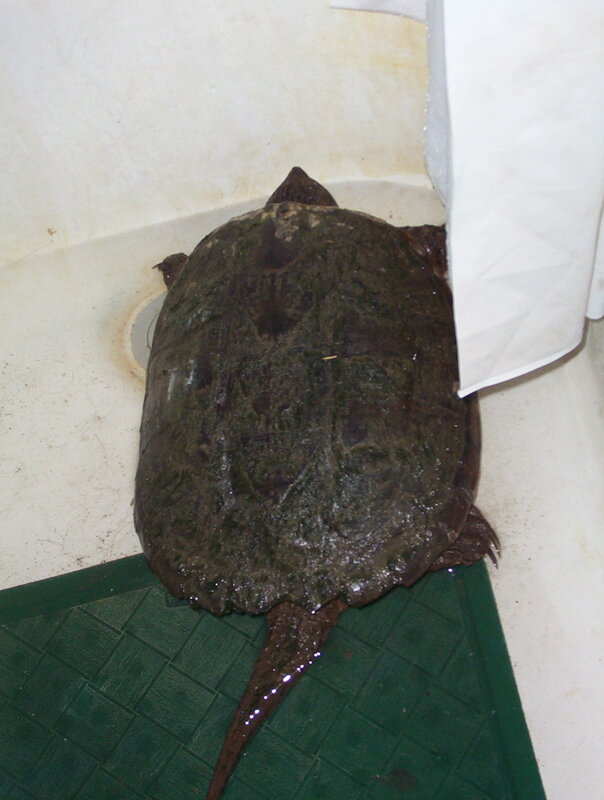 It does, however, tell us that the creature comes from the wild, as no one would own (let alone sell) a snapping turtle. Interestingly enough, there aren’t bodies of water nearby. It’s possible the little guy somehow got into the sewer system and finally got out when the waterlevel rose. We’ll take him to the river tommarrow and let him go. 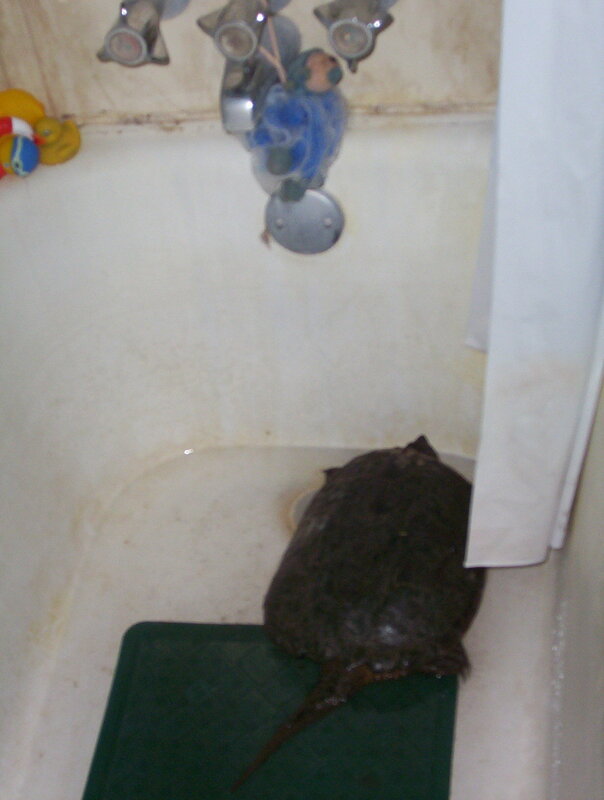 In the meantime, he’s staying in our bathtub… far far away from my fingers. Right off the bat, I’ll say that the role women play in modern games is absolutely deplorable. We want to get more female players, and yet we have such terrible female role-models in game. When was the last time we saw a strong female lead character? Now when was the last time you could play as her? In my mind, we have two specific problems: body image and character role. Let’s consider body image. We’ll begin with a test. I’ve popped over to IGN’s computer game preview section; I’ll show you the first game I see with a woman on-screen. Anyone see something wrong with this picture? Often, Too often, Almost all computer games with women characters present these women as perfect barbies with whorish revealing clothing. Consider the latest Tomb Raider game’s website, http://www.tombraider.com/ . There’s actually an area of the website devoted to Laura’s clothes. This has been one of the heaviest critiques given to video games, and I have to admit, it is an extremely well-founded argument. Now let’s consider female character roles. I’m aware of less than four first-person shooters where the player is a woman. More often than not, if a game includes a girl, she is a nurse, mother, or other member of the “supporting cast”. Luckily, a few games do include strong female leads, such as Half Life 2 and Max Payne 2. At the same time, in most of these games, the women quickly become damsels in distress. If I hear that the Bowser has captured Peach one more time… Anyway, women rarely appear as strong as their male counterparts in video games; one of the easiest ways to fix this is to provide more central female leads. Perfect Dark is actually a good example of what we should strive for more often. Of course there is much more to discuss, so… leave some comments! Although the title may appear to be metaphoric, I am really not that deep. Instead, I’m actually discussing issues relating to the exploding cost of game development, in terms of both the developers, producers, and consumers. I’ll try to cover some of the criticisms here, but feel free to add thoughts. Developers: The price of creating a game has skyrocketed faster than any artform in known creation. Players want more interactivity, better graphics, and greater freedom in their games. To keep to schedule, developers must hire more contractors, especially in the fields of art, tool, and physics creation. This outsourcing of talent leads to a wider spread in the original vision of a game. The designers may not work with the programmers or the artists, causing choppy work. Some may argue that players desire more content sooner, perhaps citing the release of episodic content such as Half Life 2 Episode 1. To satisfy this desire, developers must hire more and more employees, completing the product faster. To this, I must respond that good, memorable games usually aren’t created by throwing “man-hours” at them. Games need a unity of design that can easily become bogged down with larger developers. Consider America’s Army, a hit when the developer was still budding. As more versions were released, the Army decided to change development teams, expanding the developer size considerably. Now ask yourself, when did America’s Army start sucking? Producer: Producers spend millions of dollars financing developers, choosing games they hope will become hits. Producers, as many have noted, will therefore make safer choices, passing up oddities such as Crazy Taxi to finance the next “Quake” (What are they on? 5?) and creating a sea of the same. Look at PainKiller, Driv3r, and True Crime. None have even the resemblance of a vestigial bone of originality. This doesn’t even mention the endless march of sequels and licensed games. These games don’t sell well because they are more of the same. I don’t think gamers want to play another 20 floors of Wolf3d; I know I don’t. I understand arguments that gamers want more realism, leading producers to request larger teams that can handle “photorealism,” but I disagree with this point. I don’t think its essential for a game to be insanely realistic, or even 3D to be a best seller. Consider Viewtiful Joe, a fine game in its own right and a side scroller! How about The Sims, a game where the characters rarely have distinguishable faces? Graphics don’t make the game. Sometimes they even hurt it (think of the steep requirements on Doom 3). Consumers: Oh how long gamers have complained about buying the latest $60 flop. Heck? They complain about buying the latest $60 triple-A title. Games cost too much money, plain and simple. The industry is screaming to attract new gamers, but how can we if the price of admittance is so high? Many have complained that used game sales are killing developers, but isn’t it possible that the reason games focus so hard on used games is that new games are so expensive? I’m not able to buy any game until several months after its release, when they’ve reduced its price. Tell me what you think. I dare you. After fifteen wonderful days, Heather has left, and I return to work on this blog. We managed to cover an awfully large amount of ground, spending over 24 hours driving from one location to another. The vacation began with a visit to the Indianapolis Museum of Art. For a Midwest museum, the IMA manages to fit in a good selection of interesting pieces, including a floor held up by army-men and a painting that doesn’t actually exist. It’d make more sense if you visited, which I very strongly recommend; the museum is free for students. We then headed off to see some friends in Sandusky, OH. Popping in to Cedar Point, we stayed in a hotel for the night, leaving the next morning. I used the phrase “popping in” because we didn’t actually stay at the park for too long. I assumed we’d be around for most of the day, seeing as Heather doesn’t visit too many theme parks, but we were only at the park for, maybe, five hours. Just a day or so later, we went to the F1 race with some of my friends from the Academy. It was really great to see them all, even though I tend to dislike racing. Something about the remarkable absence of strategy bothers me. Of course, the drivers do need to define what type of equipment they ride, but it seems to me that the races are decided before the race begins. Oh well, I had fun and seeing my friends was more than worth it. Heather and I then headed off to South Bend, where we celebrated the 4th (twice, actually) and stayed with my extended family. It’s reassuring to know my family like Heather very much. While staying in South Bend, we headed over to see my mother’s friend near Valperaso. As always, it’s good to catch up with old fiends. On Friday, Heather and my second anniversary, we went to Holiday World, in Santa Claus, IN, effectively completing our unintended goal to cover Indiana from head to toe. Two theme parks in less than two weeks caused a bit of a fun overload that I’m still living down, but the park was very cute. They gave out free soft drinks and sunscreen. I found it kind of odd, but the whole park pushed the “family friendliness” aspect quite hard. The rest of Heather’s stay (about a half a week), we spent watching movies and taking walks. We ended up covering about two miles of ground in one night. I believe this stay will forever be known as the two weeks of travel. What joy. Of course, all good things must come to an end, and on Wednesday, Heather was forced to leave. It wasn’t pretty, but it wasn’t life-threatening. Meh, what can I say? Parting is such… well, you know. In theory, I’ll go there in October for a week and hopefully live with her in Vancouver in under six months. Sad memories aren’t my thing… yeesh.